Palm Beach is one of the most beautiful places in Australia. 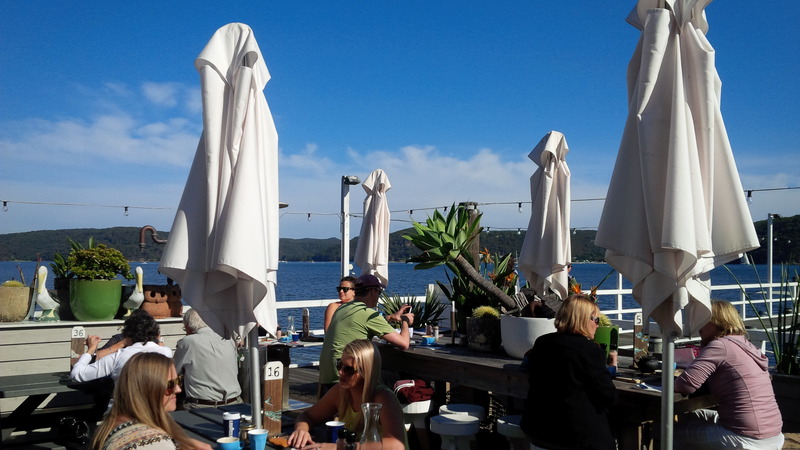 (For my international readers, Palm Beach sits on a peninsula at the end of Barrenjoey Road, between Pittwater and Broken Bay and is ~40km north of Sydney’s CBD). 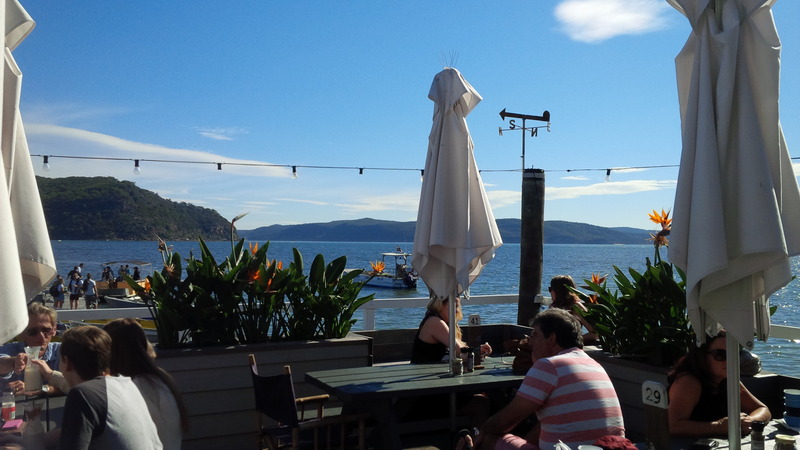 I have been spending a bit of time on the Northern Beaches of late and decided to venture further up to check out a beautiful cafe known as The Boathouse. The view from the cafe area is magnificent and it was a perfect day, as the sun painted the crystal blue waters of the beach with a beautiful white glow. Inside the cafe is a charming little kitchen with beautiful staff who are friendly with a real heart for service. The menu (on a chalkboard) has a focus on good food with simplicity as a cornerstone! It does get busy, so get here nice and early to grab a table. The burger is simply beautiful. A ray of sunlight pierces through the umbrella to clothe the burger with a reflective glow. The burger is about a mix of experiences… it’s a soft brioche-style bun which flakes in your mouth, together with the rich tartness of the cheddar clinging to the juicy succulent (well seasoned) beef patty. The crispness of the bacon partners with the crunch of the baby cos lettuce to break from the soft succulence of the rest of the ingredients to add that special texture. 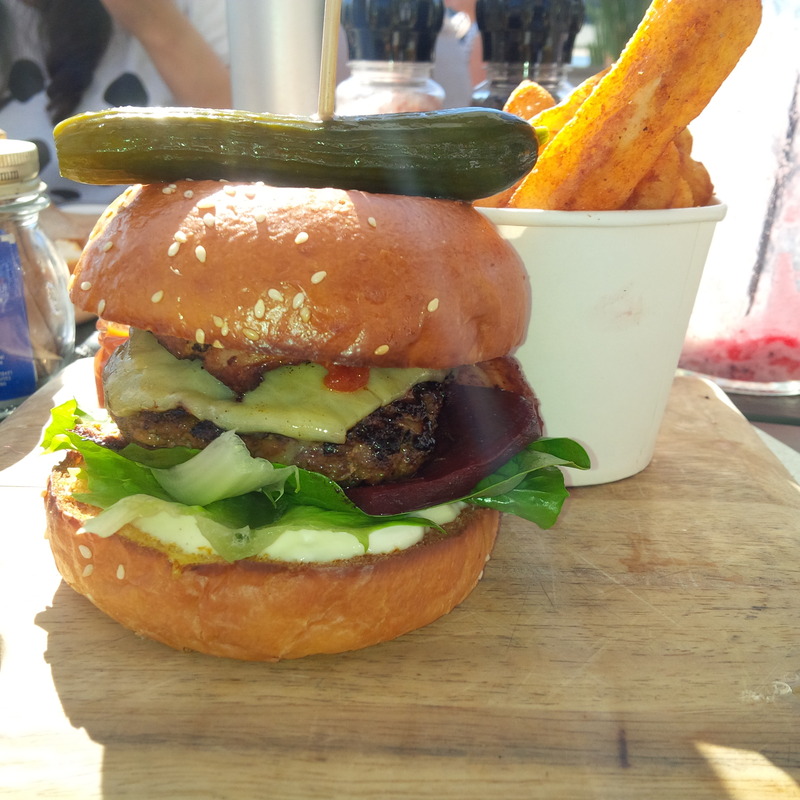 The pickles add a vinegary tang to the dish, the beetroot a light sweetness, while a lovely tangy tomato chutney graces the top of the burger and a layer of rich creamy aioli lies on the base of the burger. The interaction of flavours and the contrast of textures make this an amazing experience! 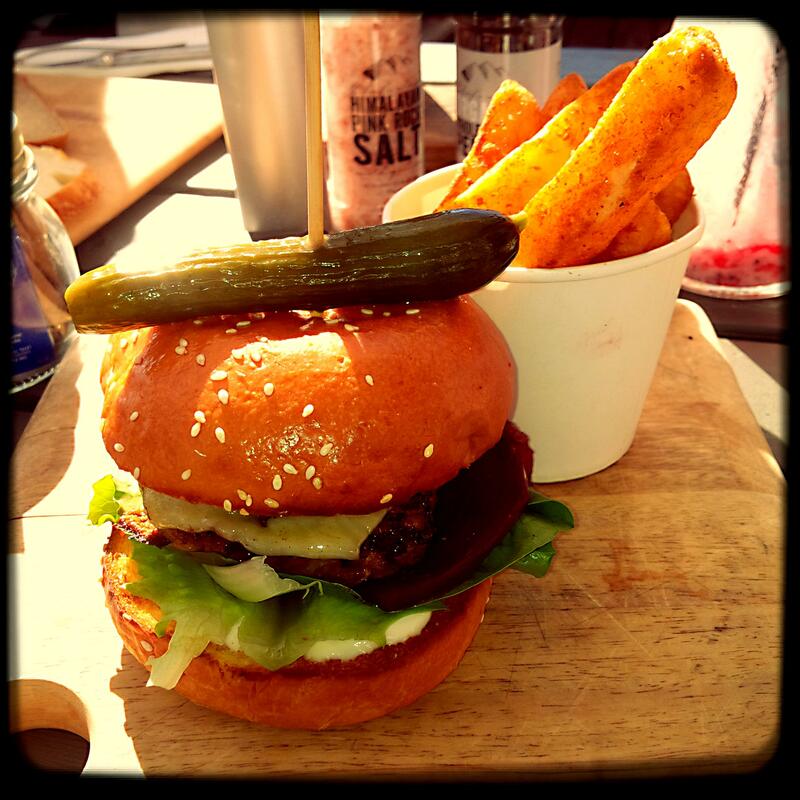 It’s a classic, I forget about everything… for that moment it’s me and the burger! Nothing else matters. 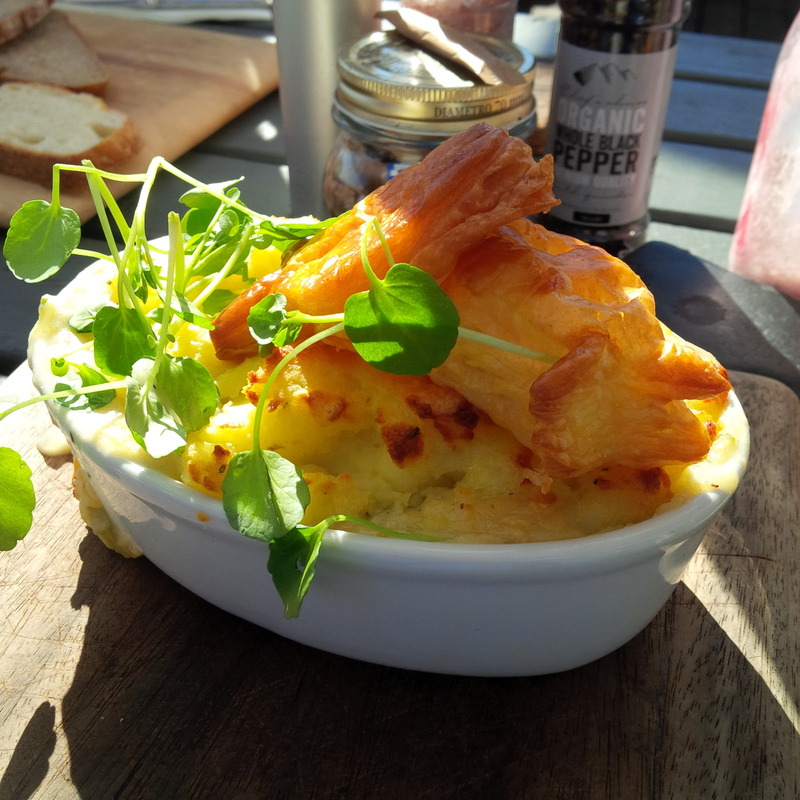 The fish pie is another simple classic dish… I actually burn my tongue on the first taste… it’s so hot. Creamy potatoes coat the top of this pie, while succulent chunks of fleshy white fish meat mixed in a rich creamy fennel and potato sauce form the lovely heart of the pie. This is the perfect comfort food. There are a couple of puff pastry pieces (shaped as a fish) which adorn the top of the pie to round out the experience. 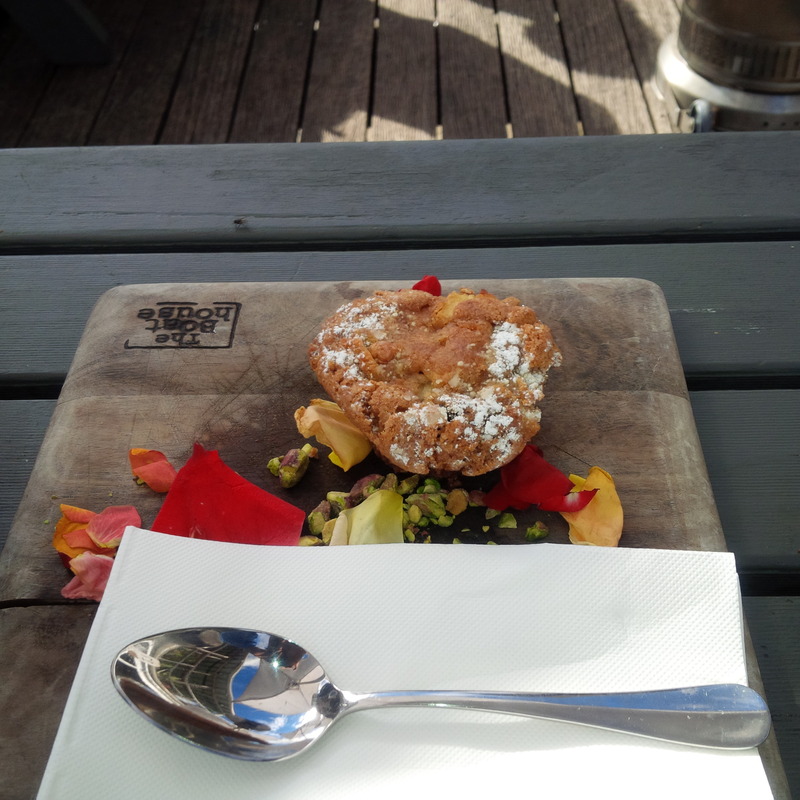 To finish there is a spiced apple and raisin muffin on a bed of pistachio nuts and rose petals! It’s beautiful, the outer coating is crumbly… when broken reveals a moist centre of the muffin. The beautiful mix of spices and sugar flows from the muffin for a silky tasting experience. It’s beautiful… simplicity can mean perfection. For drinks we have a glass of Knappstein Riesling, The Pikes Sangiovese and a Mixed Berry Milkshake. The Sangiovese was particularly good, very easy to drink – well suited to the occasion. But the wine list is not the focus (being more cafe style is not really a feature, it’s short and gives you the alcohol kick you need with your meal)… but I want to describe the “Milkshake Experience”. This would have to be one of the best taste experiences ever! The sensation of the thick creamy milk flowing through your body on a hot summer day combined with the taste of the sweet fruity berries and syrup on my tongue makes me feel like I’m dancing in the clouds. The froth of the shake just make the drink oh so light and breezy to consume. It’s so good, I can’t get enough it… I even do the undignified slurp with the straw to try to extract the final bits of goodness in the bottom of the jar. It’s such a transcendent experience. Their coffee is lovely and provides a caffeine kick to farewell the experience and provide some energy for the trip home. The last bit of the trip is spent gazing at the beauty that is Palm Beach… the pictures tell the story! Thanks Dani, Appreciate the feedback. Hope you enjoy the Boathouse and your trip to Palm Beach!